Girls - are you up for the challenge? We’re looking for females who want to do something different! Sound like you? Then let us know! IYLA stands for International Youth Leadership Award. What is the IYLA programme? We've partnered with the Girl Scouts of the USA to offer you a specially designed course that will provide you with new skills to prepare you for your summer at a Girl Scout camp. This programme has been tailor made to train Camp America applicants for an amazing summer at a Girl Scout camp in the USA. Through a mixture of online learning activities and modules, a training day in London and on-going support from professional trainers and Camp America staff, you will learn a variety of new leadership skills. You'll also be provided with access to our private social media groups for support and the chance to chat with other IYLA participants. To date, 100% of our IYLA participants have gone on to spend their summer at a Girl Scout camp after completing the course. 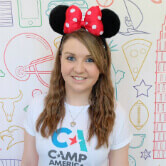 By adding the award to your Camp America application, camps will know you have the leadership skills that they need! At the end of the programme, you will be awarded a certificate of participation that will be a great addition for your CV and your future! On Saturday 26th January 2019, we'll be holding an EXCLUSIVE event for our IYLA participants. This invite only fair will allow you to come and meet over 40 different Girl Scout camps so you can come and chat to them and get hired on the spot. This means in a single day you can get your summer at a Girl Scout camp sorted. You'll also receive a nights accomodation before the fair on Friday 25th January - this is included in the cost for the IYLA course! Places for our International Youth Leadership Award are extremely limited so if you would like to sign up for this exclusive programme, contact us TODAY! The cost of the IYLA course is £40 and this will be added to your Camp America payments. Click here to download a document with all the information you need to know about the IYLA programme.